This Directive applies to the braking of all types of vehicle as defined in Article 1 of Directive 92/61/EEC. The procedure for the granting of component type-approval in respect of the braking of a type of two or three-wheel motor vehicle and the conditions governing the free movement of such vehicles shall be as laid down in Chapters II and III of Directive 92/61/EEC. In accordance with Article 11 of Directive 92/61/EEC, equivalence between the requirements laid down in this Directive and those laid down in United Nations ECE Regulation No 78 (E/ECE/324 and E/ECE(TRANS/505 REV 1 ADD 77 of 20 October 1988) is hereby acknowledged. The authorities of the Member States which grant component type-approval shall accept approvals granted in accordance with the requirements of the abovementioned Regulation No 78 as well as component type-approval marks as an alternative to the corresponding approvals and component type-approval marks granted in accordance with this Directive. adapt the Annex to technical progress. 1. Member States shall adopt and publish the provisions necessary to comply with this Directive before 5 October 1994 and shall forthwith inform the Commission thereof. 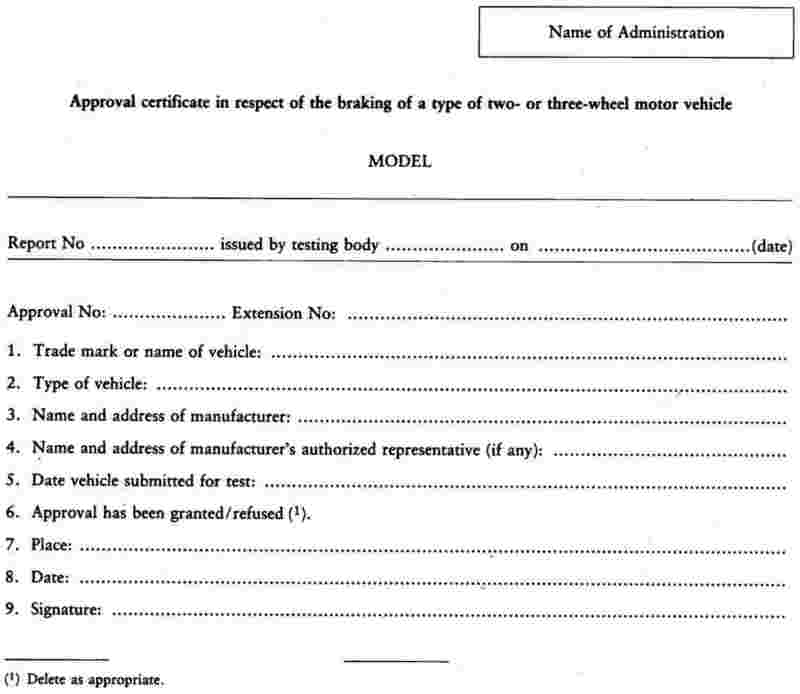 From the date mentioned in the first subparagraph Member States may not, for reasons connected with braking, prohibit the initial entry into service of vehicles which conform to this Directive. They shall apply the provisions referred to in the first suparagraph as from 5 April 1995. (2) OJ No C 93, 13. 4. 1992, p. 24. OJ No C 72, 15. 3. 1993. (4) OJ No C 313, 30. 11. 1992, p. 7. (5) OJ No L 42, 23. 2. 1970, p. 1. Directive as last amended by Directive 92/53/EEC (OJ No L 225, 10. 8. 1992, p. 1). means the combination of parts other than the engine whose function is progressively to reduce the speed of a moving vehicle or to bring it to a halt, or to keep it stationary if it is already halted; these functions are specified in 2.1.2. The device consists of the control, the transmission and the brake proper. means the part actuated directly by the driver to furnish to the transmission the energy required for braking, or for controlling it. This energy may be the muscular energy of the driver, or energy of another source controlled by the driver, or a combination of these various kinds of energy. means the combination of components comprised between the control and the brakes and linking them functionally. Where the braking power is derived from or assisted by a source of energy independent of the driver but controlled by him, the reserve of energy in the device is likewise part of the transmission. means the parts of the braking device in which the forces opposing the movement of the vehicle are developed. a different assembly of the components. means one or more of the individual parts which, when assembled, constitute the braking device. in the case of motorcycles with sidecar, a braking device which operates at least on the front and on the rear wheel. Therefore a braking device which operates simultaneously on the rear wheel and on the sidecar wheel is regarded as a rear brake. the braking force can be easily regulated with sufficient precision. means the speed which the vehicle cannot exceed, on the level and without undue external influence, taking into account any special limitations imposed on the design and construction of the vehicle. means, except where otherwise stated, a vehicle so laden as to attain its maximum mass. means the vehicle alone, as submitted for the tests, plus the driver alone and any necessary test equipment or instrumentation. means the maximum mass stated by the vehicle manufacturer to be technically permissible (this mass may be greater than the permissible maximum mass laid down by the national administration). means a brake or brakes which has/have been treated in accordance with Section 1.3 of Appendix 1. The braking device must be so designed, constructed and fitted as to enable the vehicle in normal use to comply with the provisions of this Directive, despite the vibration to which it may be subjected. In particular, the braking device shall be so designed, constructed and fitted as to be able to resist the corroding and ageing phenomena to which it is exposed. The service braking must make it possible to control the movement of the vehicle and to halt it safely, speedily and effectively, whatever its speed and load, on any up or down gradient. It must be possible to graduate this braking action. The driver must be able to achieve this braking action from his driving seat without removing his hands from the steering control. The secondary (emergency) braking must make it possible to halt the vehicle within a reasonable distance in the event of failure of the service braking. It must be possible to graduate this braking action. The driver must be able to obtain this braking action from his driving seat while keeping at least one hand on the steering control. For the purposes of these provisions it is assumed that not more than one failure of the service braking can occur at one time. The parking brake must make it possible to halt the vehicle stationary on up or down gradient even in the absence of the driver, the working parts being then held in the locked position by a purely mechanical device. The driver must be able to achieve this braking action from his driving seat. Every two-wheel moped or two-wheel motorcycle shall be equipped with two service braking devices, with independent controls and transmissions, one acting at least on the front wheel and the other at least on the rear wheel. The two service braking devices may have a common braking so long as a failure in one braking device does not affect the performance of the other. 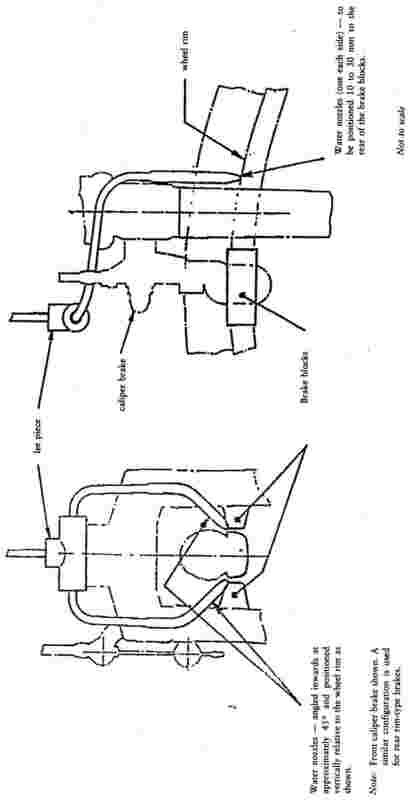 Certain parts, such as the brake itself, the brake cylinders and their pistons (except the seals), the push rods and the cam assemblies of the brakes, shall not be regarded as liable to breakage if they are amply dimensioned, are readily accessible for maintenance and exhibit sufficient safety features. A parking braking device is not compulsory. Every motorcycle with sidecar shall be equipped with the braking devices which would be required if it had no sidecar; if these devices enable the required performance to be achieved in tests of the vehicle with sidecar, a brake on the sidecar wheel shall not be required; a parking braking device is not compulsory. a service braking device which operates on all the wheels, and a secondary (emergency) braking device which may be the parking brake. In addition, every three-wheel moped must be equipped with a parking braking device acting on the wheel or wheels of at least one axle. 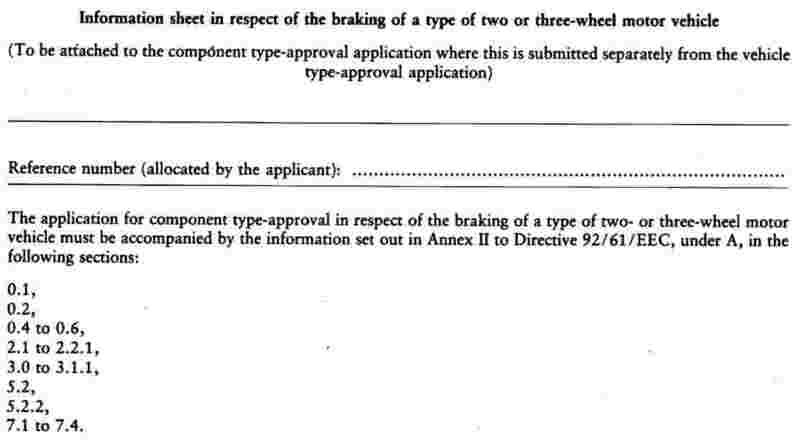 The parking braking device, which may be one of the two devices specified in 2.2.3.1, must be independent of the device acting on the other axle or axles. a parking braking device acting on the wheels of at least one axle. The control of the parking device must be independent of the control of the service braking device. The braking devices must act on brake surfacespermanently connected to the wheels either rigidly or through components unlikely to fail. The component parts of all braking devices, where attached to the vehicle, must be so secured that the braking devices do not fail in their function under normal operating conditions. The braking devices shall operate freely when correctly lubricated and adjusted. Wear of the brakes must be capable of being easily taken up by means of either manual or automatic adjustment. The brakes shall be capable of being adjusted to an efficient operating position until the brake linings have worn to the point of requiring replacement. The control and the components of the transmission and of the brakes must possess a reserve of travel such that when the brakes become heated and the brake linings have reached maximum permitted degree of wear, effective braking is ensured without immediate adjustment being necessary. When correctly adjusted the components of the braking device must not, when operated, contact anything other than the intended parts. In braking devices where the transmission is hydraulic, the receptables containing the reserve fluid must be so designed and constructed that the level of the reserve fluid can be easily checked. This provision does not apply to mopeds with a maximum speed of 25 km/h or lower. The performance prescribed for braking devices is based on the stopping distance. The performance of a braking device is determined either by measuring the stopping distance in relation to the initial speed or by the response time of the device and the mean fully-developed deceleration. during the tests the force applied to the brake control in order to obtain the prescribed performance must not exceed the maximum laid down for the test vehicle's category. the test must be performed when there is no wind liable to affect the test result. The limits prescribed for service braking performance are as laid down for each category of vehicle. The test must be carried out at the speed prescribed for the category to which the vehicle belongs, the figures prescribed in this connection being subject to a certain margin of tolerance. In the case of vehicles where the two service brakes can be applied separately, the braking devices must be tested separately. The minimum performance for each braking device for each category of vehicle must be attained. In the case of a vehicle with a manual gearbox or an automatic transmission where the gearbox can be disengaged manually, the tests must be carried out with the gearbox inoperative and/or the engine disconnected by clutch disengagement or otherwise. In the case of a vehicle with other types of automatic transmission, the tests must be carried out under the normal operating conditions. Tests must be carried out in the unladen condition at various speeds, the lowest being equal to 30 % of the maximum speed of the vehicle and the highest being equal to 80 % of that speed or 160 km/h, whichever is the lower. The maximum practical performance figures are measured and together with the behaviour of the vehicle must be recorded in the test report. In the case where two service braking devices can be applied separately, both devices must be tested together and simultaneously, with the vehicle unladen. This test must (subject to the exemption contained in 1.3.1) be carried out on mopeds and motorcylces (but not tricycles). The test procedure is identical to that for the type-0 test with engine disconnected, except for the provisions for wetting the brakes described in 1.3. Enclosed brakes: it is not necessary to carry out this series of type-0 tests on vehicles equipped with conventional drum brakes or with fully enclosed brakes which are not subject to water penetration under normal running conditions. The test with brakes subject to wetting must be carried out under the same conditions as the test with dry brakes. There must be no adjustment or alteration of the braking device other than fitting the equipment to allow brake wetting. The test equipment must continuously wet the brakes for each test run at a flow rate of 15 l/h for each brake. Two disc brakes on one wheel will be considered as two brakes. For exposed or partly exposed disc brakes, the prescribed amount of water must be directed on to the rotating disc in such a manner that it is equally distributed on the surface or surfaces of the disc swept by the friction pad or pads. For fully exposed disc brakes, the water must be directed on to the surface(s) of the disc 45° in advance of the friction pad(s). For partly exposed disc brakes, the water must be directed on to the surface(s) of the disc 45° in advance of the shield or baffle. The water must be directed on to the surface(s) of the disc(s) in a continuous jet, in a direction perpendicular to the surface of the disc, from single jet nozzles so positioned as to be between the inner extremity and a point two-thirds of the distance from the outer extremity of that part of the disc swept by the friction pad(s) (see Figure 1). For fully enclosed disc brakes, where the provisions of 1.3.1 do not apply, the water must be directed on to both sides of the shield or baffle at a point and in a manner corresponding with that described in 1.3.4.1 and 1.3.4.3. Where the nozzle would be coincident with a ventilation or inspection port, the water must be applied one quarter of a revolution in advance of the said port. Where in 1.3.3 and 1.3.4, it is not possible to apply the water in the position specified owing to the presence of some fixed part of the vehicle, the water must be applied at the first point, exceeding 45° where uninterrupted application is possible. For drum brakes, where the requirements of 1.3.1 do not apply, the prescribed amount of water must be distributed equally on either side of the braking device (that is, on the stationary back plate and the rotating drum) from nozzles so positioned as to be two-thirds of the distance from the outer circumference of the rotating drum to the wheel hub. 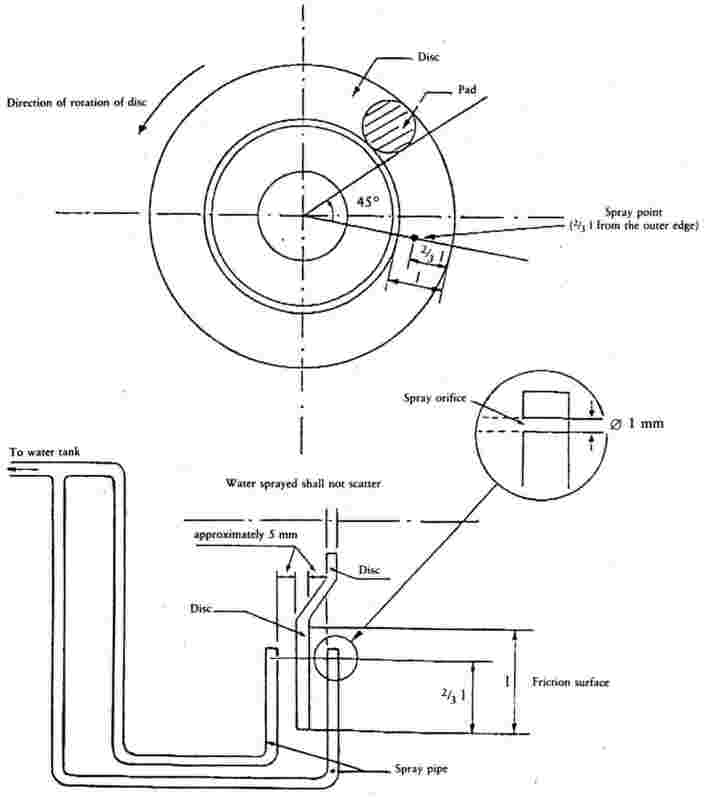 Subject to the requirements of 1.3.7 and to the requirement that no nozzle shall be within 15° of or coincident with a ventilation or inspection port on the stationary back plate, the test equipment for drum brakes shall be so positioned as to obtain the optimum uninterrupted application of water. for a distance of no less than 500 m prior to the point at which the test is to be carried out. For rim brakes, as fitted to some mopeds with a maximum speed of 25 km/h or lower, the water must be directed on to the wheel rim as shown in Figure 2. The service brakes of all motorcycles (with or without sidecar) and tricycles must be tested by a series of repeated stops, the vehicle being in the laden condition, in accordance with the requirements set out below. For vehicles equipped with a combined braking system, it is sufficient to submit this service braking device to the type-I test. The type-I test is carried out in three parts. A single type-0 test as prescribed by 2.1.2 or 2.2.3.1. A series of 10 repeated stops carried out in accordance with the requirements of point 1.4.2. A single type-0 test, carried out as soon as possible after the completion of the test specified in 1.4.1.2.2 and in any case within one minute thereof, and performed under the same conditions as those used for the test in 1.4.1.2.1, in particular at a control force as constant as possible with a mean value not exceeding the mean force actually used in that test. The vehicle and the brake(s) to be tested must be substantially free from moisture and the brake(s) cold (≤ 100 °C). for testing a combined braking system, whichever is the lower of 70 % of the vehicle's maximum speed and 100 km/h. The distance between the initiation of one stop and the initiation of the next shall be 1 000 metres. In the case of a vehicle with a manual gearbox or an automatic transmission where the gearbox can be disengaged manually, the highest gear, consistent with attaining the initial test speed, must be engaged during the stops. When the vehicle speed has fallen to 50 % of the initial test speed, the engine must be disengaged. In the case of a vehicle with a fully automatic transmission, the test must be carried out under the normal operating conditions for such equipment. For the approach, the gear suitable to the initial test speed must be used. After each stop, the vehicle must immediately be subjected to maximum acceleration to reach the initial test speed and maintained at that speed until the initiation of the next stop. If appropriate, the vehicle may be turned round on the test track before acceleration. The force applied to the control shall be so adjusted as to maintain a mean deceleration of 3 m/s2 or the maximum deceleration achievable with that brake, whichever is the lower, at the first stop: this force must remain constant throughout the succeeding stops required by 1.4.1.2.2. At the end of the type-I test the residual performance of the service braking device must be measured in the same conditions (and in particular at a control force as constant as possible with a mean value not exceeding the mean force actually used) as for the type-0 test with the engine disconnected (the temperature conditions may be different). the initial speed at the beginning of braking as defined in 2.1.1 or 2.2.2. Test speed V = 40 km/h (1) for mopeds. Test speed V = 60 km/h (1) for motorcycles (with or without sidecar) and tricycles. For the purposes of the type-I residual performance test (motorcycles with or without sidecar), the recorded performance levels in terms of stopping distances, mean fully developed deceleration, as well as the control force used, are recorded. to be achieved with each of the single axle braking devices. For the purposes of the type-I residual performances test on motorcycles (with or without sidecar) and tricycles, the recorded performance levels in terms of stopping distance, mean fully developed deceleration, as well as the control force used, are recorded. Test speed V = 40 km/h (5) for mopeds. Test speed V = 60 km/h (5) for motorcycles (with or without sidecar and tricycles. The vehicle is tested both unladen and laden. (corresponding mean fully developed deceleration 2,5 m/s2). The parking braking device must, even if it is combined with one of the other braking devices, be capable of holding the laden vehicle stationary on an 18 % up or down gradient. In the case of handbrake levers, the point of application of the manual force is assumed to be 50 mm from the outer end of the lever. The mean deceleration to be attained with wet brake(s) between 0,5 and 1,0 second after application of the brake must be at least 60 % (6) of that attained with dry brake(s) during the same time period and with the same control force applied. The control force used, which must be applied as quickly as possible, must be equivalent to that required to attain a mean deceleration of 2,5 m/s2 with dry brake(s). At no time during the type-0 test with wet brake(s) may the deceleration exceed 120 % of that attained with dry brake(s). (1) Vehicles the maximum speed (Vmax) of which is lower than 45 km/h in the case of mopeds, or 67 km/h in the case of motorcycles (with or without sidecar) and tricycles are tested at a speed equal to 0,9 Vmax. (2) For mopeds with a maximum speed of 25 km/h or lower which have a wheel rim of 45 mm or less (code 1,75), this value is 2,8 or S ≤ 0,1 + V2/73. If this value cannot be achieved by each braking device because of limited adhesion, the value 4,0 m/s2 must be applied for a test on a laden vehicle using both braking devices simultaneously. (5) Vehicles the maximum speed (Vmax) of which is lower than 45 km/h in the case of mopeds, or 67 km/h in the case of motorcycles (with or without sidecar) must be tested at a speed equal to 0,9 Vmax. (6) For mopeds with a maximum speed of 25 km/h or lawer this value is 40 %. The purpose of these provisions is to define the minimum performances for braking systems with anti-lock devices fitted to two-wheel mopeds, two-wheel motorcycles and tricycles. This does not make it compulsory to fit vehicles with an anti-lock device but if such devices are fitted to a vehicle they must meet the requirements below. The devices known at present comprise a sensor or sensors, a controller or controllers and a modulator or modulators. Any devices of a different design will be deemed to be anti-lock devices within the meaning of this Appendix if they provide performances at least equal to those prescribed by this Appendix. means a component of a service braking system which automatically controls the degree of slip, in the direction of rotation of the wheel(s) on one or more wheels of the vehicle during braking. means a component designed to identify and transmit to the controller the conditions of rotation of the wheel(s) or the dynamic conditions of the vehicle. means a component designed to evaluate the data transmitted by the sensor(s) and to transmit a signal to the modulator. means a component designed to vary the braking force(s) in accordance with the signal received from the controller. Each controlled wheel must be such that it can bring at least its own device into operation. Any break in the supply of electricity to the device and/or in the wiring external to the electronic controller(s) must be signalled to the driver by an optical warning signal, which must be visible even in daylight; it must be easy for the driver to check that it is in working order (1). In the event of a failure in an anti-lock device, the braking efficiency of the laden vehicle must not be less than that prescribed for whichever is the lower of the two requirements for the vehicle defined in 2.1.2.2 or 2.1.2.3 of Appendix 1. The operation of the device must not be affected adversely by electro-magnetic fields (2). Anti-lock devices must maintain their performance when the brake is fully applied for the duration of any stop. is satisfied where ε represents the adhesion utilized as defined in the addendum to this Appendix (3). The coefficient of adhesion utilization ε must be measured on road surfaces with a coefficient of adhesion not exceeding 0,45 and of not less than 0,8. Tests must be carried out with the vehicle unladen. The test procedure to determine the coefficient of adhesion (K) and the formula for calculating the adhesion utilization (ε) are as prescribed in the addendum to this Appendix. The following additional checks must be carried out with the vehicle unladen. Any wheel controlled by an anti-lock device must not lock when the full force (4) is suddenly applied to its control device, on the two kinds, of road surface specified in 4.1.2 at initial speeds of up to 0,8 Vmax but not exceeding 80 km/h (5). Where a wheel controlled by an anti-lock device passes from a high-adhesion surface or a low-adhesion surface as described in 4.1.2 with the full force (4) applied to the control device, the wheel must not lock. The running speed and the instant of applying the brakes must be so calculated that, with the anti-lock device fully cycling on the high-adhesion surface, the passage from one surface to the other is made at about 0,5 Vmax not exceeding 50 km/h. Where a vehicle passes from a low-adhesion surface to a high-adhesion surface as described in 4.1.2 with the full force (4) applied to the control device, the deceleration of the vehicle must rise to the appropriate high value within a reasonable time and the vehicle must not deviate from its initial course. The running speed and the instant of applying the brakes must be so calculated that, with the anti-lock device fully cycling on the low-adhesion surface, the passage from one surface to the other occurs at about 0,5 Vmax not exceeding 50 km/h. Where both independent braking devices are equipped with an anti-lock device the tests prescribed in 5.1.1, 5.1.2 and 5.1.3 must also be performed using both independent braking devices together, the stability of the vehicle being maintained at all times. However, in the tests provided for in 5.1.1, 5.1.2, 5.1.3 and 5.1.4, periods of wheel locking or of extreme wheel slip are allowed provided that the stability of the vehicle is not adversely affected. Below vehicle speeds of 10 km/h wheel locking is permitted. (1) The technical service should examine the electronic controller and/or any drive system with regard to possible failure modes. (2) Until uniform test procedures have been agreed, the manufacturers must provide the technical services with their test procedures and results. (3) For two-wheel mopeds, until a minimum value for ε has been established, the measured value must be recorded in the test report. (4) Full force means the maximum force prescribed in Section 2.4, Appendix 1 for the category of vehicle: a higher force may be used if required to actuate the anti-lock device. (5) On low adhesion surfaces (≤ 0,35) the initial speed may be reduced for safety reasons: in such cases, the K value and the initial speed must be noted in the test report. The coefficient of adhesion is determined from the maximum braking rate, without wheel lock, of the vehicle with the anti-lock device(s) disconnected and braking all wheels simultaneously (1). The braking tests are carried out by applying the brakes at an initial speed of 60 km/h (or, in the case of vehicles which are unable to reach 60 km/h, a speed of roughly 0,9 Vmax), the vehicle being unladen (apart from the test instruments and/or the necessary safety equipment). The effort exerted on the brake control must be constant throughout the tests. A series of tests may be carried out up to the critical point reached immediately before the wheel(s) lock by varying both the front and the rear brake forces, in order to determine the maximum braking rate of the vehicle (2). where t is measured in seconds. Alternatively, for vehicles unable to attain 50 km/h, the braking rate is determined by reference to the time taken for the speed of the vehicle to reduce from 0,8 Vmax to 0,8 Vmax – 20 where Vmax is measured in km/h. The maximum value of Z = K.
2. DETERMINATION OF THE ADHESION UTILIZATION (ε). The adhesion utilized is defined as the quotient of the maximum braking rate with the anti-lock device in operation (Zmax) and the maximum braking rate with the anti-lock disconnected (Zm). Separate tests must be carried out on each wheel equipped with an anti-lock device. Zmax is calculated on the on the basis of the average of the three tests, using the time taken for the speed of the vehicle to achieve the reductions in speed specified in 1.4. (1) Additional requirements may have to be established in the case of vehicles equipped with combined braking systems. (2) As an initial step, to facilitate these preliminary tests, the maximum control force applied before the critical point may be obtained for each individual wheel.